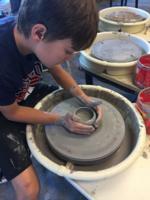 Mud Makers ~ (Ages 9 – 12) Session 1: Wednesdays, 4:15 – 6:15 pm. February 6 – March 13. Instructor: Veronica Wilde Session 2: Wednesdays, 4:15 – 6:15 pm. April 3 – May 8. Instructor: Sunny Wolfe Students in this class will learn hand building, some wheel throwing and glazing techniques. This is the perfect class to get started in our clay studio and build a foundation of tips and tricks to apply in more advanced classes. No experience necessary. $95/student, $80.75/member.